The social fabrics of Britain is in a desperately fragile state. Assaults from extremists on many sides, covering all bases of bigotry, and poisoning our political discourse in the age of Brexit and terrorism has given a hue of grim bleakness to our way of life. Language is a powerful weapon today in these discussions, often used to exaggerate or underplay something, depending on the topic and the narrative. Our biases instinctively inform how we approach topics. There is no consistency in ethical application, seen in how leftists vehemently shout down racism but then ignore anti-Semitism within their own ranks. And sometimes, something bad is morphed into something it isn’t. This can be debilitating in its effect, to lend an air of inevitability to a situation that cannot be avoided whatever the political will in the world. If you believe that there is state oppression being perpetrated against British Muslims, and you look for examples in the Prevent strategy and hostile media environment, then no amount of evidence or action will change your mind or make you want to change it. Engaging with a system whose apparatuses you regard as levered against you becomes irrational, an act of naivety in participating with a set of political mechanisms in the hope of reforming it only to achieve nothing. This is the narrative of a lot of Islamists. The West is against us. The West is our enemy. We are oppressed. There is a fundamental clash in values between the two, an argument echoed fervently by those on the far-right who regard membership to the west to be based on ethnic lines rather than a broad set of shared values and customs. The narrative further atomises communities into monocultural ones, segregated by a set of prejudices that aren’t dismantled because again, why engage with a society built upon racist structures? There are multiple problems with this. Human beings are drawn to a sense of belonging and attachment to others, something we can share. Values of family, community, reciprocity and fairness are wired into our psyche. It goes against our human nature to isolate ourselves from other groups, especially when we share towns with them, or to think that Islamophobia is so bad that we can never come to see Britain truly as home. Our hearts and minds are elsewhere. This outlook fundamentally ignores the massive transformation in racial relations between different demographics. There was once upon a time when black Britons were actively discriminated on the streets and faced major obstacles institutionally. The latter certainly exists across many parts of life, but there is also a conscious effort by part revered national institutions to embrace tolerance and inclusivity and regard diversity as a morally good thing. Turning racism into a victimization process that we are trapped in doesn’t allow us to see the change that can come about, to see the social strides that are made. We disregard them, see them as impossible and so don’t seek to make them. Cultural isolation is detrimental to all, but primarily the racially disadvantaged group because the stereotypes become harder to obliterate. History shows us that in Britain, racism exists but is also combatted. Narratives of state oppression become harder to justify when you look at Britain’s environment for Muslims and then compare it with other countries. Consider in Europe where the far-right have made huge surges into their respective political systems and what it means for Muslims there. Consider in America where a ban on Muslims caused outrage. And chillingly, in China where a million Muslims are persecuted in internment camps for their faith and are regarded as the dangerous fifth column. Are we really then calling the Prevent Strategy, a fishing net for the far-right as well as Islamists, a sign of state oppression? Anti-Muslim bigotry is growing at an unscaled rate and we should be wary of its nature. But there is little evidence to suggest that the politics of Tommy Robinson will pervade Westminster and lead to interment camps and repatriation of Muslims. Far-right bigots have increasing support but for most part remained marginalised. Moreover, using anti-Muslim bigotry as a tool for justifying social exclusion harms more than helps. And whilst a cultural retreat is understandable, no-one should be perpetuating the siege mentality with language that fundamentally pits us against the rest of British society and talks about us as oppressed victims unable to live life. Were this to be true, then the mayor of our capital city would not be a Muslim. We would not have Muslims in Parliament or in the media. This is always the risk of language. Dismiss the inflammatory, melodramatic rhetoric and you can be seen as dismissing the real urgency of tackling racism. But language crystallises the solutions we have mapped out for us. If you believe Muslims are genuinely oppressed, then the steps for integration and creating communal cohesion become harder. It also becomes easier for terrorists to reach disillusioned youth. 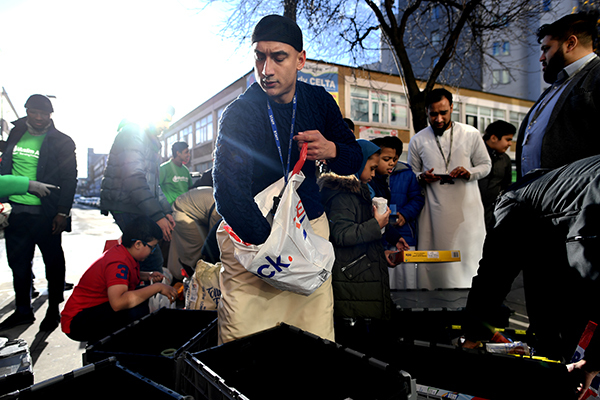 But if you believe racism is bad but there is potential to recalibrate British society into a more equal and tolerant one, and Muslims are a part of that story, you can tackle racism in an attempt to bring Muslims into the social fold. Language can determine our actions. It can shape what is possible and desirable and it’s crucial we are more careful with it.